Making the single largest capital contribution to new subway builds and extensions in Ontario’s history. The Province is committing $11.2 billion of the total estimated $28.5 billion cost to support four rapid transit projects in the Greater Toronto Area (GTA), significantly over-delivering on the government’s initial commitment to inject an additional $5 billion in capital funds into subway extensions. This includes a proposed new Ontario Line to help relieve overcrowding on the Yonge-University-Spadina Line in Toronto. Creating a truly integrated regional transit plan by extending the Yonge Subway Line to Richmond Hill and Markham and the Eglinton Crosstown Light Rail Transit Line further west into Etobicoke, as well as completing the Scarborough Subway Extension. Investing in municipal transit priorities across the province, including Stage 2 of Ottawa’s Light Rail Transit project. Expanding highways and building roads to improve the quality of life for workers and families, and promoting job creation and economic development. Promoting economic development and meeting local transportation needs in the North by reviewing opportunities for bus, passenger rail and rail freight services in Northern Ontario. Moving towards two-way, all-day service every 15 minutes on core segments of the GO Transit rail network. Improving service through the largest increase in GO Transit rail services in five years, including more trips per day, introducing route expansion and looking at the feasibility of providing flexible food and beverage services across the GO Transit rail network. Allowing kids age 12 and under to travel free of charge on all GO Transit trains and buses. 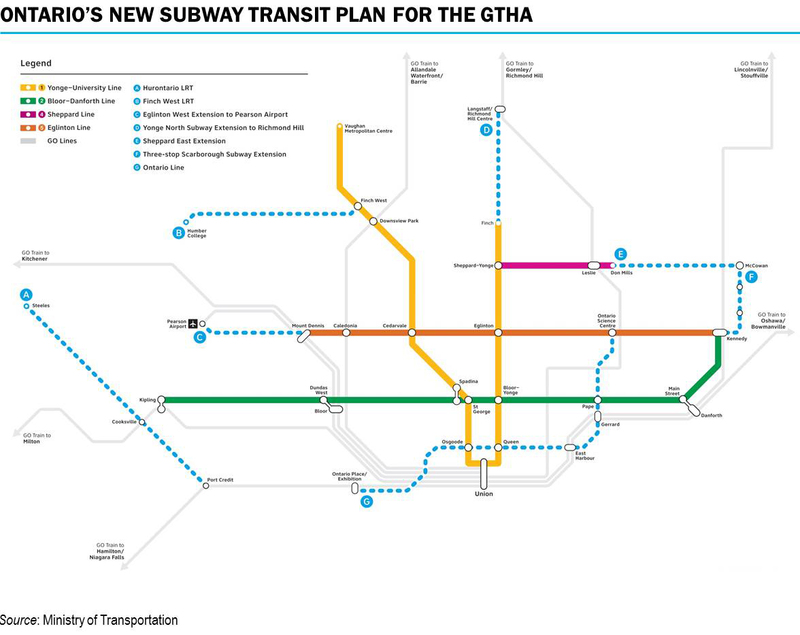 This map shows Ontario’s new subway transit plan for the GTHA, investing in subway builds and extensions that create an integrated regional transit system.